Have you dived the world's top ten? We've been publishing the list of the world's top dives since 2000 and until recently the SS Yongala consistently topped the list. Now though, the Yongala has been forced into third position. She's still my favourite dive site though. The dives are fairly evenly balanced between Northern and Southern hemispheres, the South winning by 6 entries to 4. It is also a 6:4 ratio in Reefs versus Wrecks. The list is compiled from divers' votes - cast your vote here. 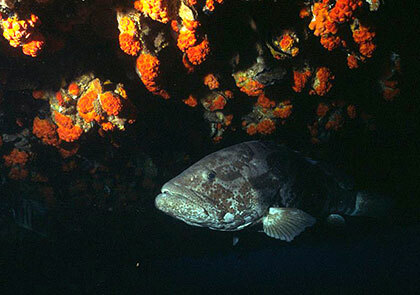 We know it's difficult to choose your favourite dive sites, and we ask you to choose just two! You may also be interested in our Best Wreck Dives list and the Top Dives in Europe. Wall of coral where sharks come cruising by and barracuda surround you. You are guaranteed to see big stuff here and lots of it. Occasional strong currents blast over an underwater prairie that's home to white tips, turtles, grouper, jacks, bumphead parrotfish and of course the barracuda that give it its name. The Yongala is a shipwreck off the coast of Queensland. Full of life you may see manta rays, sea snakes, octopuses, turtles, bull sharks, tiger sharks, clouds of fish and spectacular coral. The Yongala sank during a cyclone in 1911 killing 122 people, a racehorse called Moonshine and a red Lincolnshire bull. She had no telegraph facilities and so could not be warned of the weather ahead. In 1981 the Yongala was given official protection under the Historic Shipwrecks Act. The ship is 90 km southeast of Townsville, 10 km away form Cape Bowling Green. 109 meters long, the bow points north and the ship lists to starboard. A large wreck which needs several dives to do it justice. 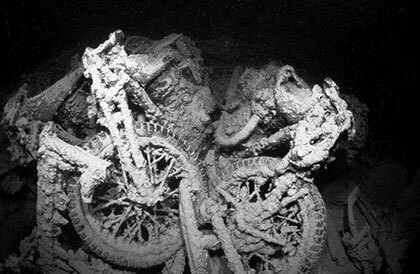 A British vessel, the Thistlegorm (Blue Thistle) was attacked from the air and sunk in 1941 whilst carrying a cargo of war supplies: rifles, motor bikes, train carriages, trucks. Currents can be strong, and in different directions at the surface and at the wreck. 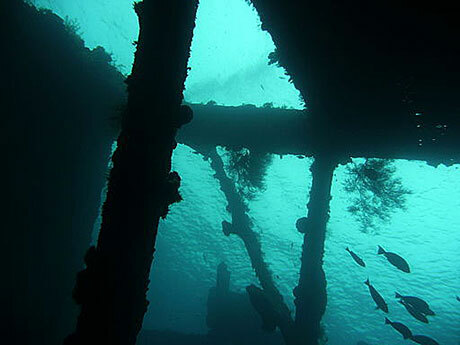 Compare prices of Thistlegorm trips. Three dives in one: anemone city, shark reef with its spectacular drop off and the wreck of the Yolanda. Currents make this good for drift dives and for pelagic fish. 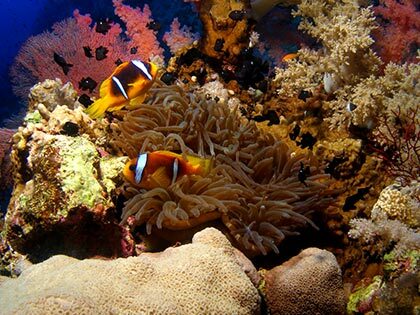 A popular dive starts at Anemone City before drifting to Shark Reef and its drop off. Finish up on the wreck of the Yolanda with its cargo of toilets. Underwater lights placed on the ocean floor attract infinite amounts of plankton, which in turn attract the huge, yet beautiful manta rays of Kona Hawaii. The rays get so close to you, that you often have to move to avoid them accidentally hitting you. An amazingly wonderful and unforgettable time with one of the most beautiful animals in the world. 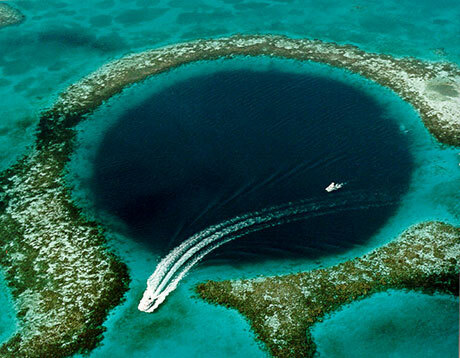 Very deep, wide, hole outlined by coral reef and inhabited by sharks. Is there another sight like it? 30 m visibility coming over the bathwater warm reef of vibrant colors, descending into a cool, deep blue hole where the water begins to waver and shimmer as you enter the transition from salt to fresh water at about 15 m. Watching the enormous tuna and other pelagics dive into the hole to clean themselves as you briefly remove your octopus to taste the fresh water. Then descending another 25 m to explore the stalagtites and stalagmites of ancient caverns. 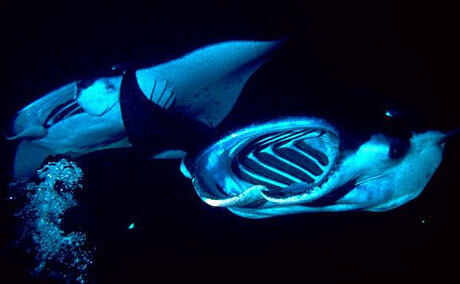 Compare prices of Belize diving trips. This wreck is very popular with photographers as it is totally encrusted in anemone, gorgonians and corals. 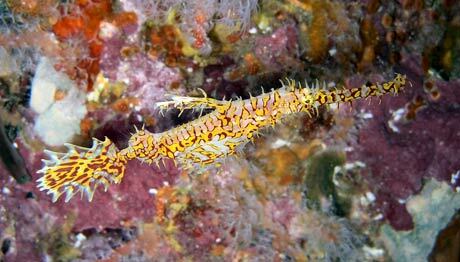 Look for the hawksbill turtle which practically lives on the Liberty and interesting small stuff like the beautiful purple Scorpion Leaf Fish and Ornate Ghost Pipefish. 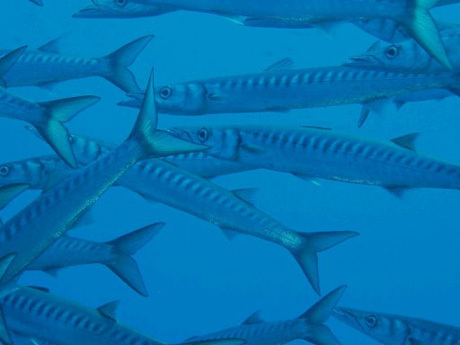 Larger fish you might see there include Great Barracuda and Flapnose Ray. The wreck is quite broken up but you can go in the cargo hold. You dive it not so much for the experience of wreck diving but for the fabulous sealife. Usually dived from the shore, the Liberty is also on some liveaboard itinaries. A horse shoe of rocky pinnacles, just breaks the surface at low tide. 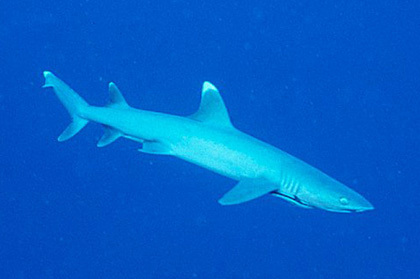 Famous for whale shark sightings, but also great for big schools of pelagic fish such as jacks, barracuda and batfish. Mantas are also seen, and it is a superb spot for Macro photography with such creatures as ghost pipefish, harlequin shrimp, frogfish and seahorses. Currents can be strong. Needs several dives to see the whole area. How much to dive Richelieu Rock? Extending 300 m from shore, the T-shaped structure is 300 m wide, including two outlying "dolphins" (platforms for larger ships to tie up to). Although a very defined and somewhat compact site, you could spend 5 days diving there and not be bored, particularly at night. On any dive there are lots of nudibranchs and flatworms, eels, woebegone and white tipped sharks, octopuses, lion and scorpion fish, stargazers, and the usual smaller finned friends. Sometimes you'll come across absolutely huge rays dozing in the sand. Want to know more? Discover the best 100 dives, best wreck dives and top dives in Europe. 300 pages detailing some of the world's best dive sites.